‘Politics’ are often defined from a macro perspective: an outlook that privileges formal structures of decision-making, gaining positive mass media coverage and achieving clear sets of listed demands. Rather than viewed as a fundamental part of political activism, daily life at Occupy protest camps is either caricatured as subcultural lifestylism, or seen as an elaborate set upon which the ‘real action’ occurs. This macro-perspective is unable to understand the relationship between everyday dynamics and the formation of broader politics. As we (among many others) have written, what makes Occupy unique is its insistence that “change must be in the process as much as in the outcomes.” We think of Occupy camps’ everyday processes in relation to the idea of ‘home-building,’ developing this term from Jeff Juris who adapts it from bell hooks. For us, home-building is about the ways we move through and construct camp space with others. 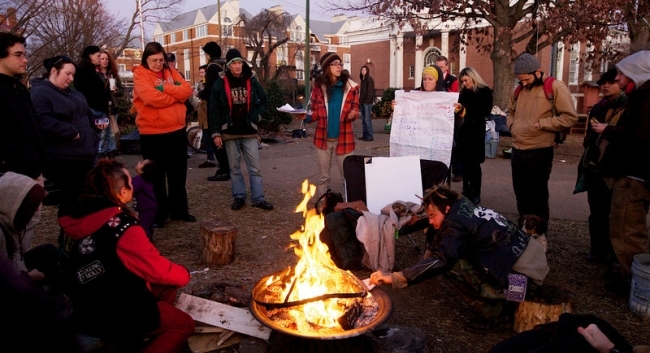 These everyday interactions often lead to larger decisions and directions for an Occupy camp. Some examples of this are the adoption of the Safer Spaces policy at Occupy LSX and the revision of Occupy OWS‘ early declaration, or the creation of spaces like People of Colour, queer, women’s-only and well-being tents in various camps across the Occupy movement. Often, there is a series of daily interactions and exchanges at a camp that prompt a coming together of people sharing a pattern of experiences. Together they formulate a policy or position that is then taken to/through the General Assembly. These are often linked to the creation of a new space or working group, the redrafting of a document, or other material and infrastructural changes, that can, in turn, shape broader movement campaigns and strategies. These everyday experiences, or micropolitics, can come about in response to the words on a sign someone is making; they can relate to the text on a flyer that is circulating; they might arise from the atmosphere in a communal tent during a late night hang out. When these experiences accumulate and are collectivized through conversation, they become the ‘big issues.’ It is usually only in this big issue form that they are documented and addressed more broadly, particularly in academic research and by the media. While large-scale controversies make headlines and proliferate as conference abstracts, the everyday experiences that comprise them tend to go unmarked as part of the political process. Yet it is often momentary, interpersonal exchanges that both underlay the development of large-scale disputes and carry with them the potential for transformations in people’s consciousness. The Campfire Chats project is an experiment in how we share and document experiences of everyday lives in relation to political activisms at Occupy protest camps. We work from the idea that objects form an active, fundamental part of the day-to-day operations of protest camps–be they materials (tents), practices (GAs) or ideas (‘We are the 99%’). Campfire Chats prompt participants to tell stories in relation to protest camp objects. As Sara Ahmed argues, it is through and around objects that we form attachments and political orientations. The Campfire Chats experiment comes, in part, out of our view that while contextually very different, all protest camps share a set of ‘promiscuous infrastructures’, a term we adopted out of a collaboration with artivistic. We can better understand and compare experiences across the Occupy Movement movement by starting from the daily objects and operations that construct and sustain (or fail to sustain) life at a camp. Capture protest camps as active, agential spaces that necessitates care. For our project Chats will be audio recorded, with all names anonymised and consent forms given out. They can also be run without recording, using another method of documentation. Ideally chats will be co-facilitated with (1) a conversational facilitator and (2) a note-taker, time-keeper, vibes watcher. During the chats participants will sit in circle around a table or surface. A deck of object cards will be laid in front of the participants. These cards contain images and words pertaining to protest camp life. The words and images on them have been garnered through google image searches, facebook sites, and a ‘crowdsourcing’ project run from Nov 2011-Dec 2011. Cards are also tailored toward particular camps, featuring images of local sites and objects. The cards work as prompts for the discussion. During the discussion the facilitator watches to see when a new card should be turned and prompts participants to expand on and synthesise each others’ contributions. This workshop is designed to serve as a means of gathering research, documenting life at the camps, and as a movement-building exercise. Like any experiment, the process will be refined over time and with feedback and input from others. The pilot Campfire Chats card deck used in Canada can be downloaded here. Anna Feigenbaum is a member of the Protest Camps Research Collective. Anna has participated in advanced facilitation and safer space training. She has run a number of workshops for community and university organisations exploring group dynamics, power and privilege, and collective problem-solving. This Campfire Chats project for Occupy comes out of a combination of these interests. This program sounds wonderful as a for community building. Do you have a “sister” for Occupy groups who do not share physical space and who would like to increase nonviolent communication and a strong sense of community among members? 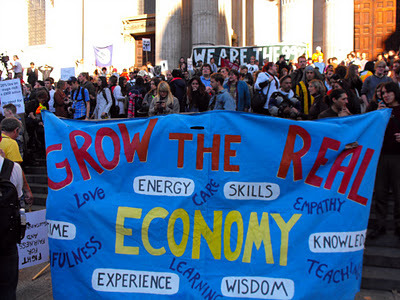 There are many smaller groups popping up all oberlike this – folks who join together to promote and support Occupy values and goals, engage in strategic actions etc. but who do not camp. From my experience as a member of such a group and from having camped at other groups, I believe I see a real difficulty in building community in the non-camp groups. I would very much appreciate hearing if you/anyone else has such such a program. If not can you direct me to any resources that may be helpful?